The Gospel Coalition recently posted my review of Christopher Lane’s new book on Norman Vincent Peale. Here’s the opening, but you can click through to read the full review. When asked about his religious background during the 2016 campaign, Donald Trump frequently mentioned Norman Vincent Peale. Peale, who died in 1993, was the most famous clergyman in America during the 1940s and early 1950s. When Trump was a child, his family regularly attended Peale’s Marble Collegiate Church, and the minister presided over Trump’s first wedding ceremony. Trump credited Peale’s bestselling book The Power of Positive Thinking with helping him maintain an optimistic attitude during his difficult bankruptcy in the early 1990s. 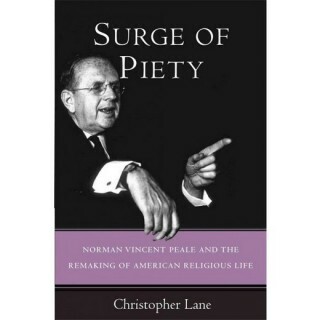 With Peale as his inspiration, Trump said he “refused to give in to the negative circumstances and never lost faith in myself.” Now that one of Peale’s disciples sits in the Oval Office, there couldn’t be a better time for the publication of Christopher Lane’s Surge of Piety: Norman Vincent Peale and the Remaking of American Religious Life.